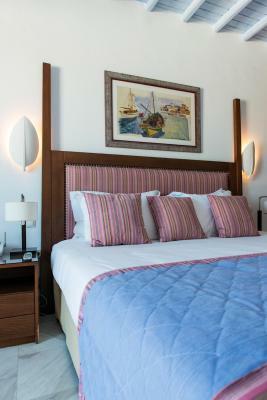 Lock in a great price for Poseidon Hotel Suites – rated 9.2 by recent guests! The breakfast was excellent and we were able to park our motorcycle in the hotel car park. This made very easy. Could walk to everything in the old town. 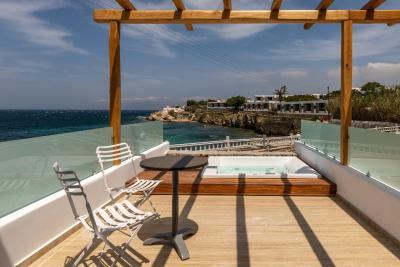 Booked one of the rooms that had an outdoor jacuzzi which was the selling point for me. 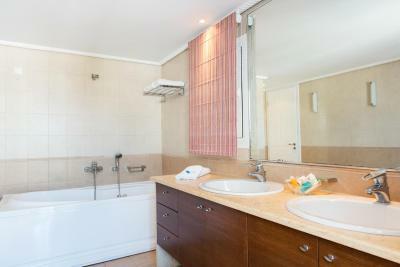 The property was always kept clean and the same could be said about the room we had. 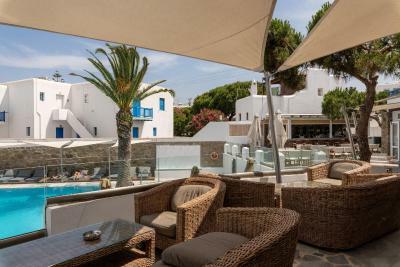 Hotel is close to little Venice and the popular windmills. The pictures don't do justice to this place. 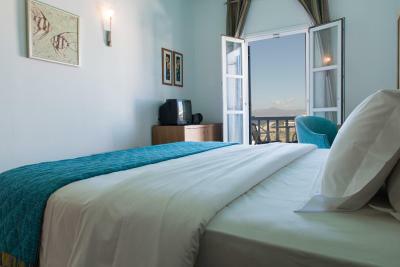 The rooms are extremely clean and the view is spectacular. 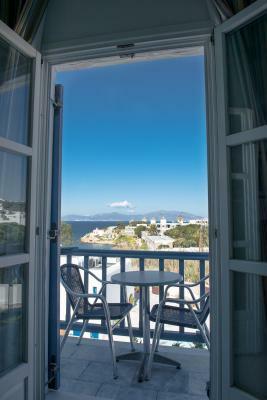 It is walking distance from Little Venice and Bus stations that take you to Paradise beach. Also rental cars are available at walking distance. They provide free breakfast and had a wide variety. Free Airport/Pot pick up and drop off. Fantastic view and location. The staff was very accommodating and they have a great breakfast. 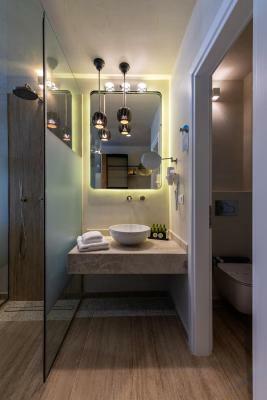 We had two rooms in this booking, one was in the newer building and had a private spa on the balcony - this room was beautiful, well equipped and modern. 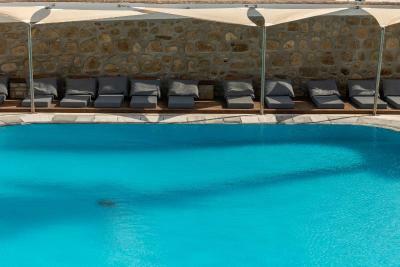 The pool area is sublime, good amount of day beds to lay on, pool bar just up the stairs. 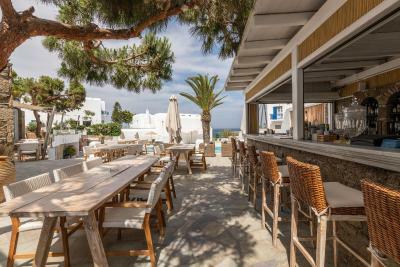 Location is great, not directly in the city center, but a 50 m walk up the road (no footpath though so you have to be careful) and you're into the pedestrian area and checking out the Windmills and other sites of Mykonos. 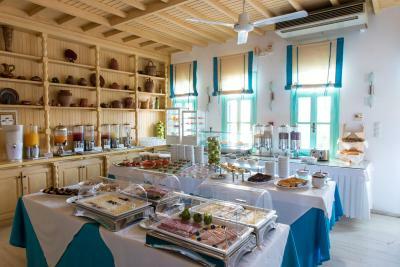 Buffet breakfast was outstanding, exceeded my expectations both in quantity, variety, and quality. 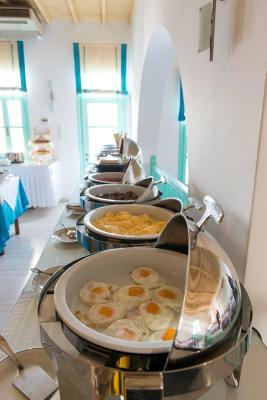 The complimentary breakfast is extraordinary --- so much delicious food and fresh juices! The views from the property are absolutely gorgeous and makes you feel like you landed in a perfect oasis. 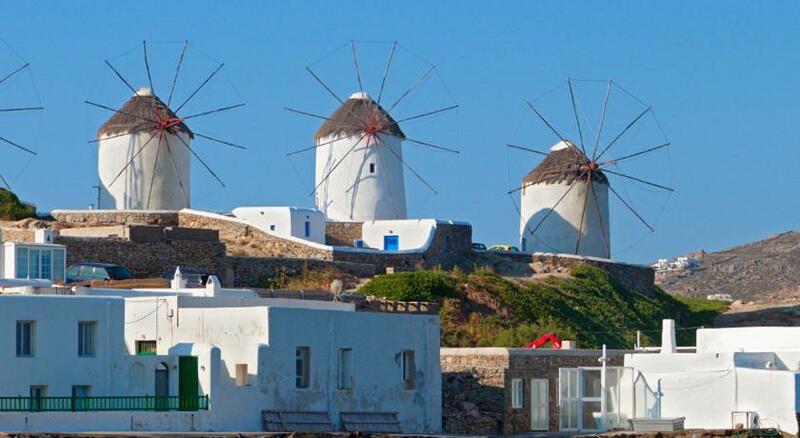 Walking distance to the heart of Little Venice of Mykonos and the picture perfect windmills. The room was beautiful. 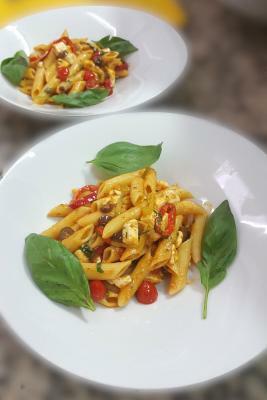 The staff was friendly and went out of their way to accommodate us. The breakfast was excellent and abundant. Overall a very pretty place. New facilities, excellent location! 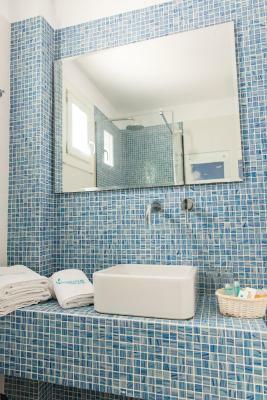 Book a room with jacuzzi! You won’t regret it :) the pool bar, game room, and everything was just great! 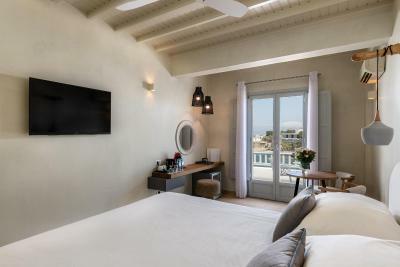 Poseidon Hotel Suites This rating is a reflection of how the property compares to the industry standard when it comes to price, facilities and services available. It's based on a self-evaluation by the property. Use this rating to help choose your stay! 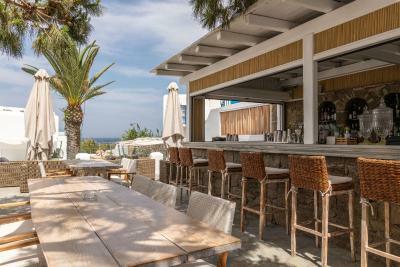 One of our top picks in Mikonos.Overlooking Mykonos Windmills, the Poseidon Hotel Suites is only 150 feet from Megali Ammos Beach. 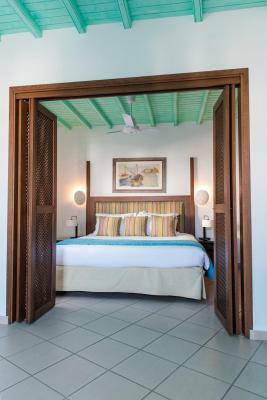 The 3-star hotel offers a freshwater pool, and bright rooms with air conditioning and fan. 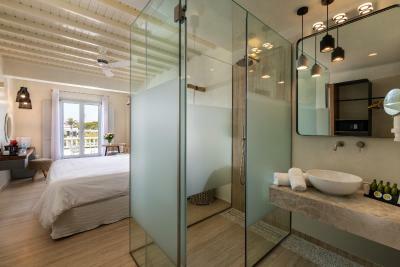 Each of the Cycladic rooms opens to a private balcony with across to the town of Mykonos, the sea and Delos. A fridge, satellite TV and safe are standard. Free round-trip transportation services from the airport or port is offered. 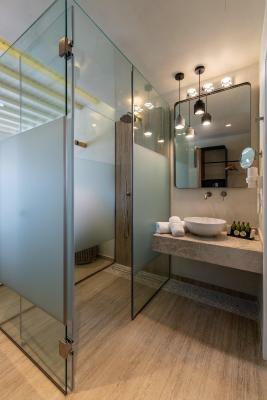 Poseidon provides free Wi-Fi in public areas, and on-site parking is also free. 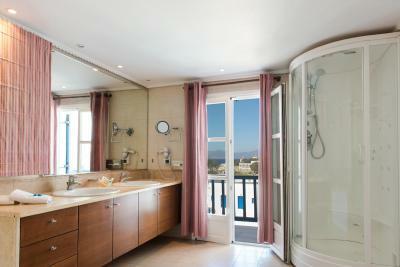 Guests can rent Poseidon’s motor yacht and explore the magnificent beaches of Mykonos. 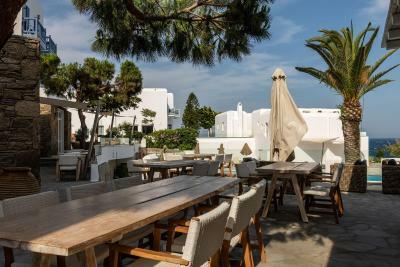 In the breakfast room and its cool patio, guests can taste homemade local delicacies, fresh fruit and good quality coffee. 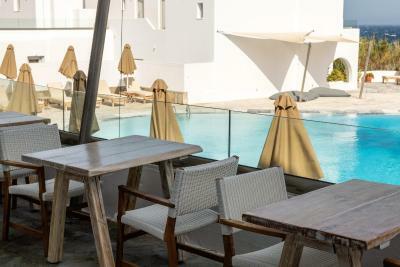 The Alley Bay serves exclusive cocktails, a few steps from the Poseidon. 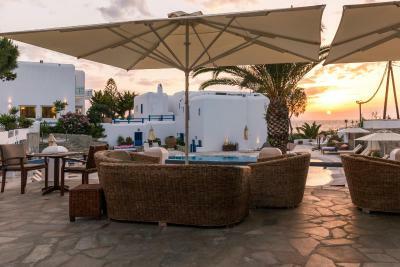 The Poseidon is just 650 feet from the famous Mykonos Windmills. 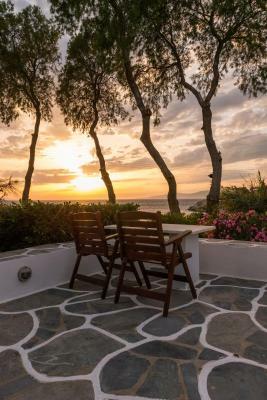 Right next to the hotel, guests will find small sandy coves and a pathway that leads to the picturesque chapel of Agios Charalambis. 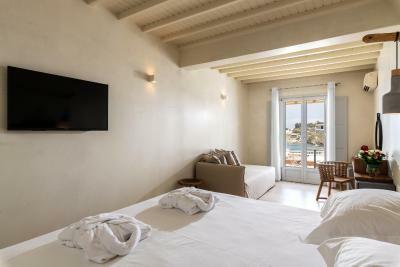 When would you like to stay at Poseidon Hotel Suites? 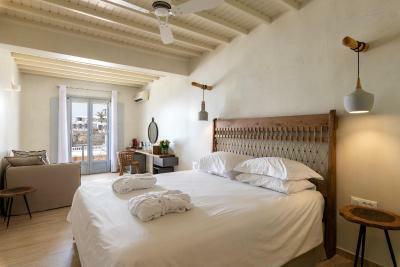 Traditionally decorated, this air-conditioned room features views of the Aegean Sea, the garden and the windmills. It has a flat-screen, satellite TV and a mini fridge. 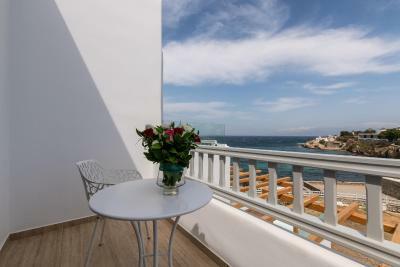 Fitted with a spa tub, this air-conditioned and traditionally decorated room opens to a spacious balcony overlooking the sea, the pool and the windmills. It has a flat-screen, satellite TV and a mini fridge. 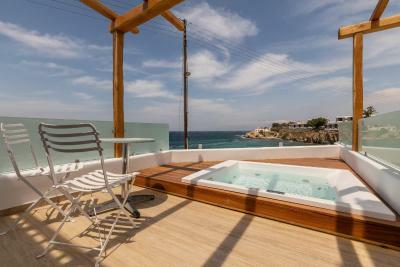 Featuring a spa tub, this air-conditioned suite has a separate bedroom and includes Aegean Sea and pool views. It has a sitting area with sofa and a flat-screen, satellite TV. A mini fridge is included. 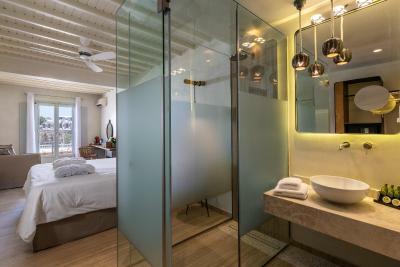 Just a few feet from the sea, this air-conditioned room opens to a private balcony overlooking the garden and the windmills. 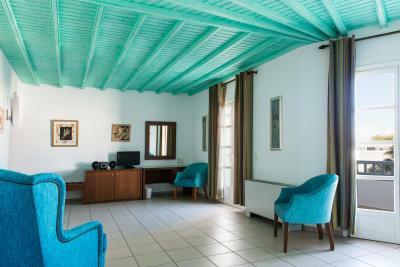 Traditionally furnished, it also has a flat-screen, satellite TV. 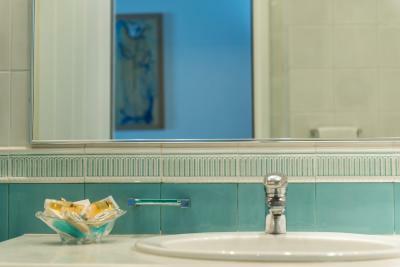 House Rules Poseidon Hotel Suites takes special requests – add in the next step! 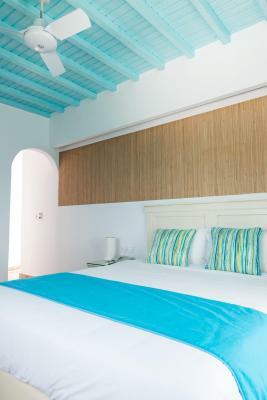 Poseidon Hotel Suites accepts these cards and reserves the right to temporarily hold an amount prior to arrival. Please note that the hotel provides a free shuttle service from and to airport/port. 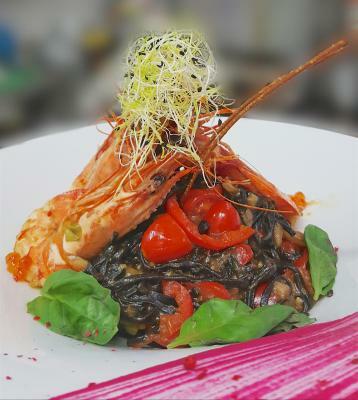 Guests have to inform the hotel 3 days prior the arrival should they wish to use the service. Please note that the credit card is used for pre-authorization issues. 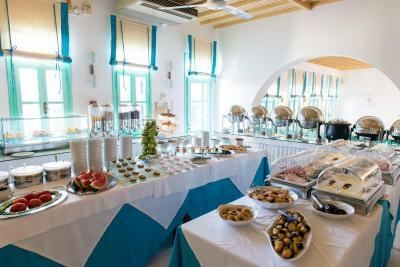 Suggestion to the property is to provide a variety of other food items for the breakfast buffet since the buffet spread was exactly the same for the 3 days that we were there. Clean, good facilities, excellent breakfast. Easy access to the city. Excellent transfer service. Would recommend it. We stayed in the hotel from October 12th and had a nice sunny weather. It was also windy. Water in the pool was really cold and unheated. The guests sunbathed on deckchairs, but no one used an unheated pool. Despite the agreed transport from the airport, the driver was not at the agreed time. 20 minutes after my phone call, the driver came to the airport. The room was cleaned afternoon at 4pm. The balcony has no drying stands. The breakfast room is in a small enclosure without a beautiful view. The windows are very small here. The private hot tub was very disappointing. Could not use it for the first day and a half. Had to be left on for a minimum of three hours and would not stay on. Would have been nice to know that when we checked in. Also, I let the desk know our first morning @ 730am of the problem and that we would be gone all day and would like it fixed by 5 pm. That never happened and was 9pm before we could use. It also had a brown film around the top and a strange odor. No soap holder in shower. Very slippery balcony and shower, had a bad fall. Friendly, efficient and helpful staff. 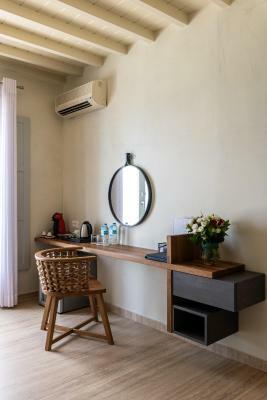 Clean and welcoming facilities. Good meet and transfer service. The reception staff weren't that friendly or polite, bit of a shame as the rest was great. Facilities were great and beautiful views of the sunset from bedroom balcony. Pool area was great and breakfast was good. Great location to the town. Concierge people were good also, super helpful and took is to the port. The view from our room overlooked the sea towards the town but the foreground was a little bit disappointing - just a rough area that wasn't very attractive. Maybe a room higher up would've been better if that's something that would bother you. Nice balcony though. Also nice views from the common areas around the rooms. The rooms was spacious with good storage provided and very comfortable. 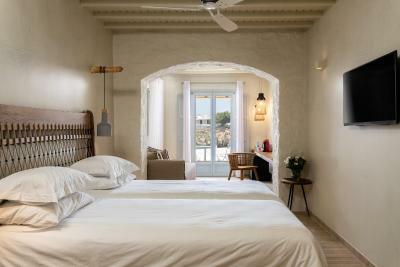 The comfort products provided in the room were also really nice- made from olive oil- smelled divine. The hotel was in a convenient location - just a short walk from the centre of town. The pool and surrounding area was clean and pretty - also in a sheltered location from the wind the island is prone to experiencing. Nice bar with seating area. 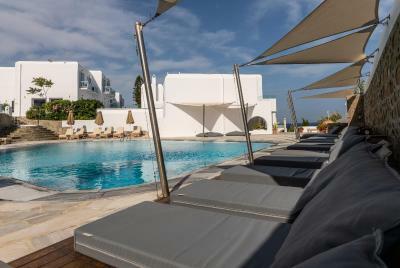 We didn't use the sun beds or pool during our stay as the weather wasn't warm enough but they looked very comfy. Breakfast was good with a nice selection on offer.